Hi everyone, hope you have been well and apologies for the absence but this week I have been a busy bee and been to some real treasures for you to look and mouth water too. Although this isn't a restaurant and purely a take-away service it is 100% worth a mention. Floating around on the magical world of the internet I had seen these luminous rainbow bagels that looked like something out of a story or some children's play dough. 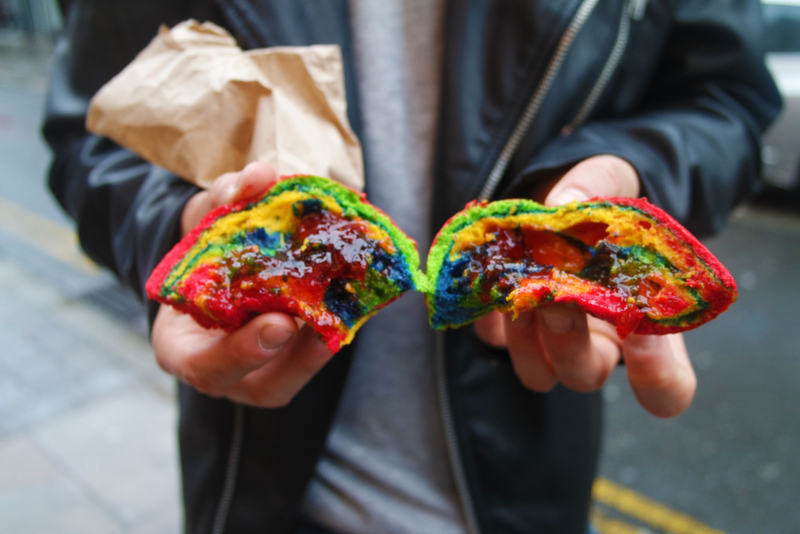 Arriving from New York's rainbow bagel trend by mixing food colourings and different sweet flavours you create these awesome doughnut shaped treasures which is all a bit of fun. Situated on Brick Lane there are two bagel shops a white faced one and a yellow one which are both open 24hrs a day! A great market for the clubbers around Shoreditch, because I'm sure if you come out of a club at 4am and you smell a salt beef bagel - you're going to buy one. This time the yellow shop might have won over the hearts of the hipsters. In the window is a display of plain bagels but suddenly your eyes get drawn over to red, yellow and blue stripy patterned ones. I pulled Andrea in so quickly, I was basically jumping around like a puppy. A lovely woman served us and we both said that we wanted the rainbow bagels, and to be honest I didn't know what to have because Andrea and I were heading out for dinner after so we didn't want anything too heavy. We both settled for sweet. I Nutella and Andrea had jam. After a few seconds each was wrapped in small brown paper bags. I was expecting to pay over £2.50 for one of these as whenever you buy bagels in super markets they are normally overpriced. I was so shocked when she said that they were £1.80 for the both! What a bargain. After stepping outside it was "a-photoshoot-with-the-bagel-time". Right next door was a spray painted wall; white and perfect for a colour explosion. Taking a bite it actually was super sweet. The colourings in the dough does make the bagel a little sticker than usual. I think they are better with sweeter fillings instead of savoury as it might be a little too heavy however cream cheese would be ideal as it really shows you the colours and patterns and not too overloading. It was a great place for a quick snack while wandering the streets of Shoreditch. A place where anything goes and nothing is a surprise. Even multicoloured bagels.